A team of scientists from the Helmholtz Zentrum München and the Technical University of Munich (TUM) has successfully developed a new type of microscope. The NeuBtracker is an open source microscope that can observe neuronal activities of zebrafish without perturbing their behavior. This is opening up completely new perspectives for science, because now it will be possible to track natural behavior while simultaneously imaging neuronal activity in the brain. 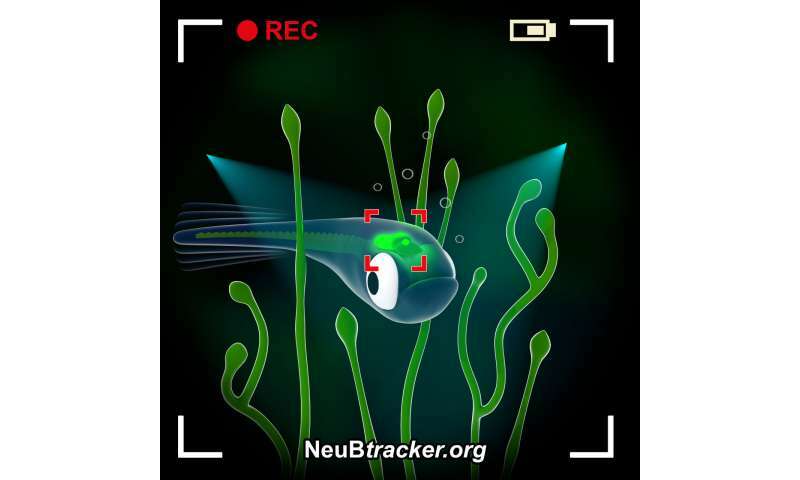 NeuBtracker is equipped with two cameras: One tracks the unrestrained behavior of the zebrafish larva while the other automatically remains pointed at the transparent head, and consequently the brain, to record fluorescence images. "This approach makes it possible to observe neuronal activity during unrestrained behavior. We can test the larvae in different environmental conditions and can immediately analyze the effects," says Prof. Dr. Gil Westmeyer at the Helmholtz Zentrum München. For example, by adding substances that influence metabolism, it is possible to observe resulting neuronal events in the brain in vivo. "Now we can finally simultaneously observe the effects of physiologically active substances on the behavior and brain activity," says Panagiotis Symvoulidis from the TUM and the Helmholtz Zentrum München and the study's first author. "The selective expression of fluorescent sensor proteins allows us to detect the activity of particular neurons." Dr. Antonella Lauri from Westmeyer's team adds, "Consequently we can see exactly which areas in the brain are active during specific behaviors." The new instrument is a so-called open-source microscope. This means that instructions on how to build the microscope are freely available. "We wanted to give our scientific colleagues the possibility to build their own NeuBtracker because we had been waiting for such a device for years," Westmeyer explains. "It is finally possible to see the effects of pharmacological substances on the behavior and the neuronal activity, or other cellular signal processing events, at the same time, and across an entire organism. This systemic approach enables us to make new discoveries, and we will, for example, seek to use this device in drug discovery and metabolic research."